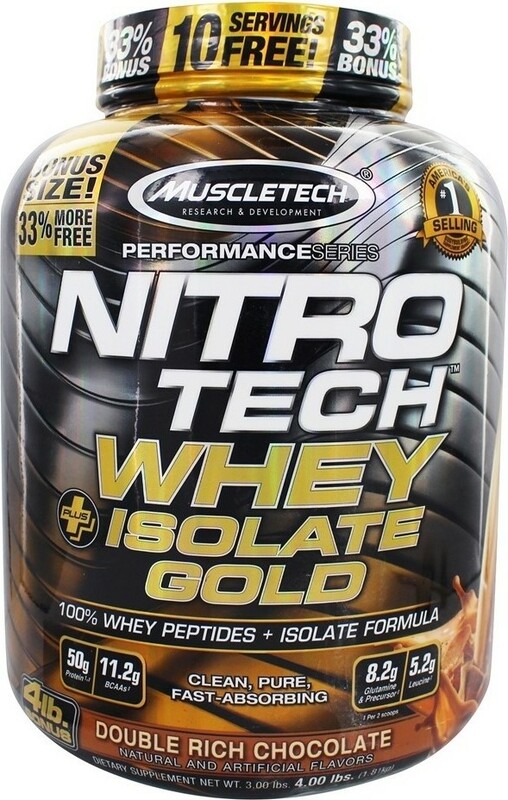 Muscletech Products Performance Series Nitro Tech Whey Plus Isolate Gold is a 100% whey peptides and isolate formula. For over 20 years, Nitro-Tech has been a leading protein brand. Built on a foundation of human research and cutting-edge science, it has earned the trust of countless consumers worldwide. Now the researchers at Team MuscleTech are proud to present a new formula based completely on rapid-absorbing whey peptides and high-purity whey isolates. Introducing Nitro-Tech Whey + Isolate Gold – a whey peptides and isolate formula that's micro-filtered to remove more carbs, fat and lactose while retaining more BCAAs, aminos and glutamine! Whey protein peptides and isolate provides your body with the highest biological value (BV) protein fractions. BV is a measure of how much of a protein's amino acids your body absorbs and retains – the higher the value, the more musclebuilding potential. 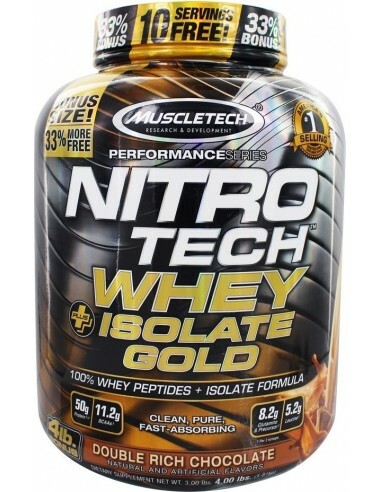 This is why Nitro-Tech Whey + Isolate Gold uses only ultra-pure, micro-filtered whey protein peptides and isolate. Each two-scoop serving delivers 50g of protein, 11.2g of naturally occurring BCAAs, and 8.2g of glutamine and precursor to help build lean muscle and promote recovery. Each delicious scoop of protein also delivers a complete spectrum of musclebuilding amino acids – includiing high levels of all nine essential amino acids. MuscleTech - Real Science. Real Results! Today, MuscleTech is a brand name synonymous with premium-quality, top-of-the-line products that span more than a decade, including Nitro-Tech, Cell-Tech, Nano Vapor, Mass-Tech, just to name a few. The top-tier development of these supplements has established a proud legacy, and this legacy stands unmatched amongst competitive companies in the supplement industry. A portion of every dollar spent on MuscleTech supplements is allocated towards funding scientific research to discover new and more effective ways to help increase lean muscle mass and strength, reduce bodyfat and improve athletic performance. MuscleTech is committed not only to industry-leading research and development, but also to protecting our discoveries with numerous patents which help to ensure that other companies do not make, use or sell their patented MuscleTech formulas. The end goal of this is to make your decision crystal clear when it comes to choosing a trusted MuscleTech supplement over poor-quality copycats available on the market.